LISBON (Reuters) - Portugal said on Sunday it would exit its three-year 78-billion-euro bailout this month without a precautionary credit line, as the country returns to growth after years of painful austerity and unpopular reforms. The cabinet decision was announced by Prime Minister Pedro Passos Coelho in a televised address to the nation and means the country will no longer have to answer to foreign creditors after the bailout ends on May 17. "The government has decided to exit the assistance program without turning to any kind of precautionary program," Prime Minister Pedro Passos Coelho said, flanked by his entire government which met Sunday to make the decision. "This is the right decision," he said, adding that Portugal's European partners would back whatever decision the government took. Portugal is the second euro zone country after Ireland to exit an assistance program. "The European Commission takes note of this decision and, as previously stated, will support the Portuguese authorities and people in this sovereign choice," said Siim Kallas, vice-president of the European Commission, in a statement. 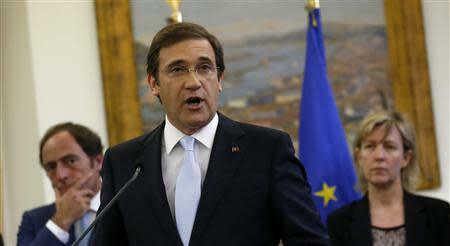 Lisbon is set to formally communicate the decision to the Eurogroup of finance ministers at a meeting on Monday. The decision to exit the bailout without a security net is a major success for the government, which has won over investor confidence by sticking to the harsh austerity and reforms required by the bailout. Lisbon was forced to seek the bailout from the European Union and IMF in 2011. "By agreeing to adopt what was imposed by the international creditors, Portugal won the ticket to get a free ride from the strong international recovery," said Filpe Garcia, head of the Informacao de Mercados Financeiro consultancy. The center-right government has stuck to the bailout plan and met targets to cut the country's budget deficit. That cost it some support but the government's popularity has stabilized since the economy started to recover in the middle of last year. The government's biggest challenge has come from the country's supreme court, which has shot down a number of austerity measures demanded by the bailout. "The Portuguese authorities have established a strong track record of policy implementation to address the country's long-standing structural problems," IMF Managing Director Christine Lagarde said in a statement. "This bodes well as Portugal exits its EU/IMF-supported program." Portugal's economy suffered its worst downturn since the 1970s under its bailout. But economic activity turned positive again last year and bond yields have fallen sharply this year, boosting optimism that Portugal would be able to exit the bailout and return to financing itself in bond markets. The country passed the last review by creditors of its economy under the bailout last week, putting it on track to exit the plan without needing further help. "The fact that Portugal doesn't need a precautionary program is another vote of confidence by European partners," said Felipe Silva, head of debt at Banco Carregosa. "Investors accept Portugal's risk and that is very positive." Portugal's 10-year bond yields currently trade around 3.65 percent - close to the lowest levels in eight years - after peaking near 17 percent at the height of the debt crisis in 2012. Portugal's 10-year yield trades around 220 basis points over equivalent German bonds. At one point at the height of its debt crisis, many economists thought the country would be forced to default on its debts like Greece. Instead, by making a clean exit from the bailout without needing a financial backstop, Portugal is following in the footsteps of Ireland, which became the first euro zone country to successfully exit a bailout in December.